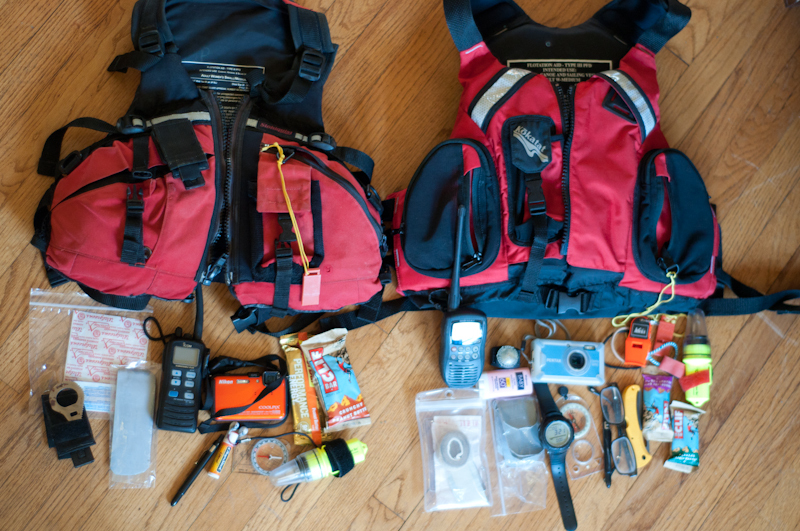 Our last post about PFDs resulted in a number of queries via Facebook and email: "So what do you carry in your PFDs? 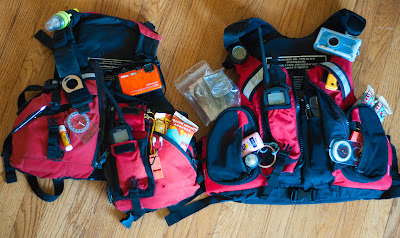 What's inside each of our pockets: Sharon (left) and Alec (right). 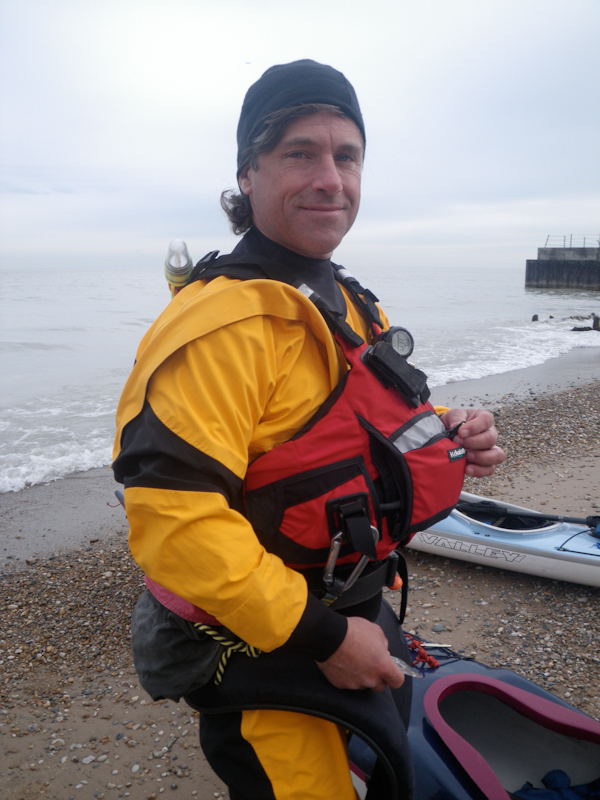 As we mentioned, this is a topic we recently researched through interviews with a number of notable sea kayak coaches and expeditioners. 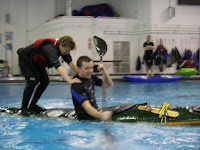 We had begun paring down on our kit, and we wondered what other paddlers were doing. Alec: back-up reading glasses, hair ties. View number two, with everything spread out. Some people carry a hydration pack, which is a convenience but adds considerable weight and bulk. That can put strain on your back and shoulders. We were curious what our kit weighed, so we put it on a scale. Alec's kit weighs two pounds (32 oz. ), without the plate. Our philosophy for whether something belongs in/on our PFDs or in a day hatch is this: If we are likely to need it while we're on the water, and if it isn't a burden, it's in our PFDs. But if we can reasonably expect to stop and get something from a day hatch, it can stay there. Carrying more kit does make a PFD heavier and bulkier, which is hard on your body, diminishes flexibility, weighs you down and makes it harder to self-rescue. Those are safety considerations. But needing something you can't access is also problematic. Like everything else, there aren't any cut-and-dried answers. It's a judgment call. But it's a good idea to reconsider what you're carrying each time you go out and adjust it for the expected situation. 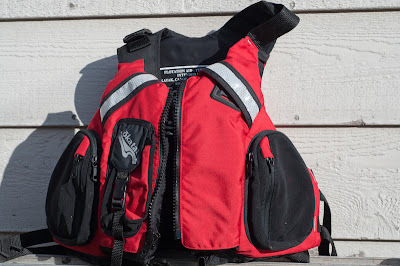 So what do you carry in and on your PFD? Eventually, even the best gear wears out. After six years of heavy use and exposure to the elements, the fabric on Alec's Kokatat MsFit Tour PFD was deteriorating, the retroreflective tape wasn't retroreflecting, and the zipper tabs were gone from the pockets. Sadly, it was time to replace it. Nothing lasts forever, not even a well-made PFD. We think pretty differently about some aspects of sea kayaking than we did six years ago, so this was an opportunity to consider whether a different PFD might be better. We no longer try to stash in them everything we could possibly need if we were separated from our boats and far from shore. In fact, we try to carry as little as possible for the conditions in which we're paddling. No more flares, signal mirrors, hefty first aid kits, and excessive food and water. 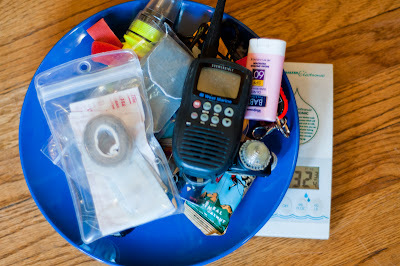 Like many of the coaches and expeditioners we interviewed for a Summer/Fall 2011 article in Adventure Kayak Magazine, we now consider it a hazard to be overburdened with gear, so we try to carry only the essentials and ensure that many items serve multiple purposes. If we need more than that, we've really screwed up. But some things haven't changed. 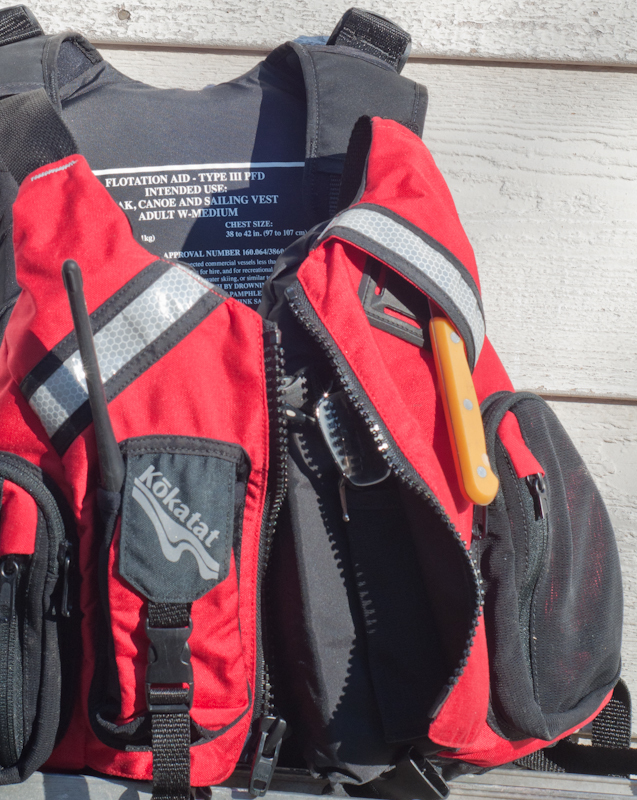 Kokatat still offers terrific gear that's made in the US and backed by excellent customer service. And the MsFit Tour is still the gold standard among PFDs--another observation we made while researching our article, "The Right Stuff." 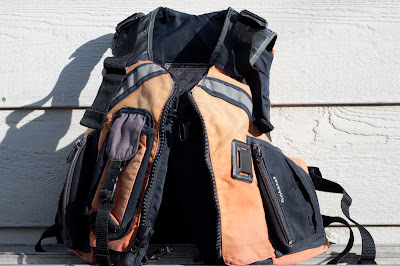 So we decided to try out the Ronin Pro, an attractive vest with only one big pocket because it is designed for whitewater paddlers, and the new MsFit Tour. The new Ronin Pro (left) and MsFit Tour (right). Alec was the only one of us in the market for a new PFD, so we got a small/medium Ronin Pro (the smallest size for that model) and a medium MsFit Tour. Both fit Alec, who is 5'4" and 140 pounds; neither was small enough for Sharon, who is 5'1" and 110 pounds and was therefore relegated to documenting the product testing. The new MsFit Tour features a clever pouch above the lash tab so a knife can be tucked in. The new MsFit Tour boasts some improvements over the old one. The Gaia PVC-free foam feels comfy and broken in when it's brand new, and the zipper tabs are larger and sturdier. The two side pockets are slightly larger and have an extra zippered pouch on them. The lash tab has been moved up and the fabric pouch on the shoulder extended down to provide an ingenious spot to tuck a knife. No more intimidating students or losing $60 knives! The Ronin Pro features exceptionally large cut-outs around the arms. The Ronin Pro is also impressive. Like the MsFit, it is comfortable, solidly built and very adjustable. The cut-outs around the arms are larger, providing more freedom of movement, and there's foam underneath the side straps, offering additional protection from side impacts. Alec in the Ronin Pro. A paddler with a short torso fill find it especially bulky over the stomach. But the Ronin Pro has some down sides, at least for a paddler of Alec's size. There's a lot of additional foam on the chest because US Coast Guard regulations require Type III PFDs to have 15.5 pounds of buoyancy, and if you remove some foam from around the arms, you have to put it somewhere else. For a paddler with a short torso, this means extra foam on the stomach, where it gets in the way during self-rescues. In addition, it was impossible for him to wear a tow belt beneath it in the front. A single pocket sounded like an attractive feature now that we carry less kit, but Alec discovered that he was always rooting around in it to find what he needed. Having three pockets, even if they aren't full, is better for staying organized. And there was no place on the Ronin to carry a VHF radio. The MsFit, by contrast, offered plenty of external pockets, that snazzy new knife pouch, and an internal pocket for a grease pencil and glasses. 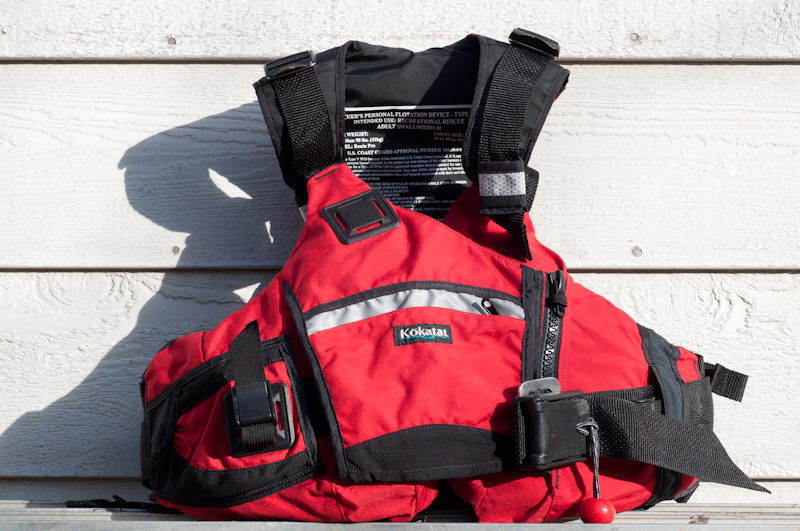 Even though that pocket can only be accessed by opening the zipper, internal buckles keep the PFD safely secured. The slimmer profile was better for rescues, too. In the end, Alec chose to stick with the MsFit Tour. 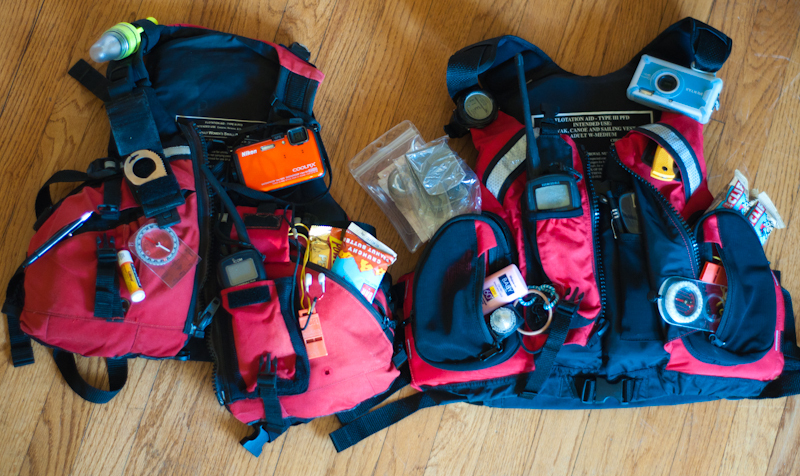 It's simply better suited to sea kayakers, and especially for guides and instructors, who need to carry a certain amount of kit in an organized manner on their bodies. Some day, we hope someone will figure out a way to add buoyancy without bulk. Or perhaps over time we'll discover that we need to carry even less kit, or that PFDs need less foam. 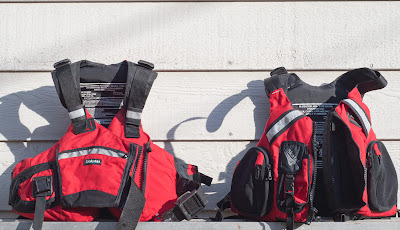 Until then, the MsFit seems to offers an excellent combination of fit, adjustability, workmanship, pocket configuration and other features for sea kayakers. Sometimes, like Dorothy, you go out looking for your heart's desire only to find that you had it in your own back yard. The lake looks like a mosaic now. A mosaic is a conversation that takes place on surfaces. A mosaic is a conversation with light, with color, with form. A mosaic is a conversation with time. If you've outgrown your drysuit, go ahead and resolve to lose some weight. Otherwise, try these on for size and choose the ones that fit. 1. Work on skills that don't come easily to me. 2. Seek out a mentor who can challenge me in my long-term development as a paddler. 3. Join organizations that protect the environment. 4. 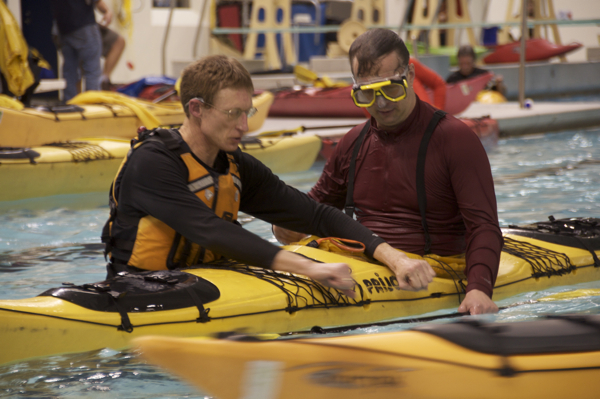 Introduce kayaking to someone else. 5. 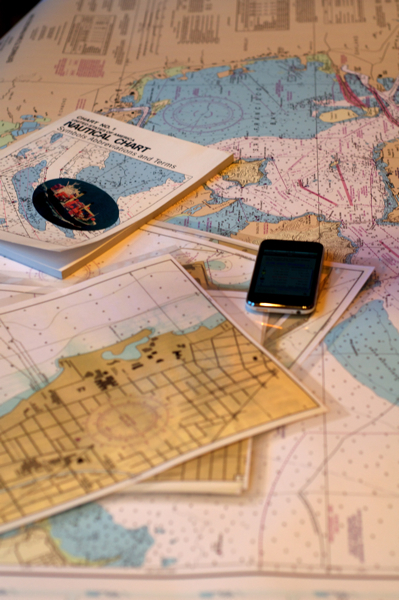 Complete a risk assessment every time I go out on the water and file a float plan. 6. 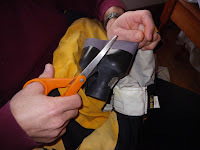 Learn to repair my boat and gear (or at least some of it). 7. Engage in a thoughtful debrief after each paddle to learn from my experiences. 8. Support my local paddlesport shop as much as possible. 9. 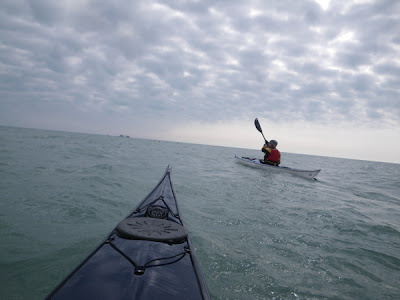 Practice rescues in the conditions and seasons in which I paddle. 10. Learn to tie a new knot. 11. 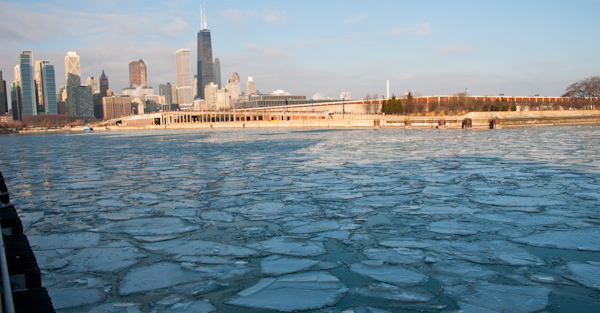 Learn a related body of knowledge (e.g.wilderness first aid, leave no trace, meteorology). 12. Paddle in unfamiliar waters (preferably outside my region). We hope 2012 is a happy, healthy year that fulfills all your paddling desires.